New York Yankees outfielder Giancarlo Stanton is not worried about his struggles to start the 2018 season. "Just got to look at it as a bad week," Stanton told reporters Sunday. "The season's much longer than a week. A couple of good games, and I could turn it around and help us win." Stanton is 7-for-42 (.167) with three home runs and seven RBI over his first 10 games in pinstripes. He went 0-for-7 with five strikeouts in Sunday's 8-7 loss to the Baltimore Orioles, his second time already this season with five strikeouts in a game. ESPN Stats & Info noted it was the first time during baseball's live-ball era that a player had gone hitless with five strikeouts in multiple games in a season. He's struck out 20 times overall. With the Yankees off to a 5-5 start, Stanton has already heard his fair share of boos raining down from the Yankee Stadium crowds. "When he's right with his timing, it'll start to happen in a big way. 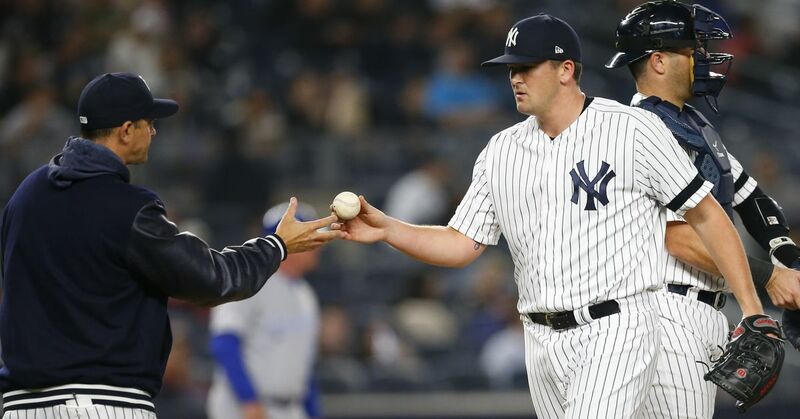 And once that happens, he'll get rolling and be a dominant player," manager Aaron Boone said. "Hitting is a grind, and when you're not raking or you're not doing as well as you can, yeah, you think about that. You wear that. You take that home with you. "But you also understand—and I know he understands—just how special he is. Once he does lock in that feeling, that feeling we look for as hitters, I don't worry about it anymore. He'll explode." The Yankees are still fourth in runs scored despite Stanton's struggles. And shortstop Didi Gregorius is off to a red-hot start, hitting three home runs, driving in 10 runs and leading the team in every major offensive category. Aaron Judge, who alongside Stanton was supposed to create the best middle of the order in the sport, has homered just twice in 38 at bats. Odds are Stanton and Judge will only get better.